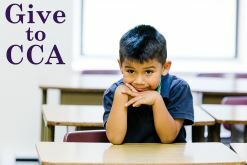 Find Out Why CCA Is Special! (Narrator) What do you want to be when you grow up? (Child 1) I want to be a scientist. (Child 2) Professional basketball player. (Child 3) I would like to be a writer. (Child 4) I want to be a policeman. (Child 5) I want to be an astronaut. (Narrator) Community Christian Academy believes that all children should have access to a scholarly, Christ-centered education. At CCA, skills-based reading and writing programs, concept-based math and science programs, as well as engaging fine arts, foreign language, and technology combine to provide a well-rounded curriculum. Small class sizes ensure individualized attention for each student in all content areas, preparing them for success. CCA maintains a Christ-centered approach to all subjects, teaching our students to examine life through the lens of God's work. Community Christian Academy. Excellent, affordable Christian education. 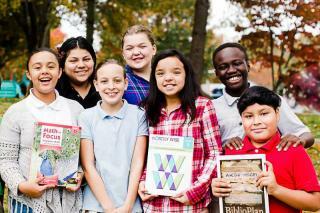 Community Christian Academy is an independent Christian school that exists to provide excellent, affordable Christian education. Seeking to reflect the diversity of the Body of Christ, we serve families from various socio-economic, racial, and denominational backgrounds. The school’s goal is to develop critically-thinking students who will engage the culture by living lives that demonstrate scholarship, servant-leadership, and devotion to Christ and to mankind. Join us on May 16, 2019 at 10:30 a.m. to learn about how your child can have a high-quality, affordable, and Christ-centered education. We'd love to share our school with you. Registration is required.